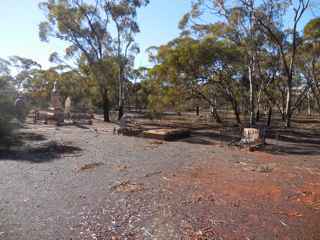 Bulong is a ghost town from the gold rush era dating back to the late 19th to early 20th century and is situated 32 kms east of Kalgoorlie W.A. This cemetery is situated on the Bulong-Curtin Road and is almost 5 kms from the earlier Bulong Road Cemetery. Although there are only 20 remaining headstones scattered over the fenced area of the cemetery there are almost 100 recorded burials that took place here. The last burial being that of Jeremiah Mullan, publican of the Federal Hotel, Bulong, who died on 7th November 1915 and is buried in an unmarked grave. The GPR holds 20 grave and 20 person records for the cemetery.